Visiting vineyards brings to mind images of France, California, Italy, South Africa, or Australia. So, when Flemish Brabant tourism invited me to tour the vineyards of the Hageland region, I was surprised. But I decided to throw my doubts to the wind and go ahead with the tour. And what a tour it was! It was terrific tasting wines right in the vineyards while cycling around the Hageland region. We even visited Horst Castle! 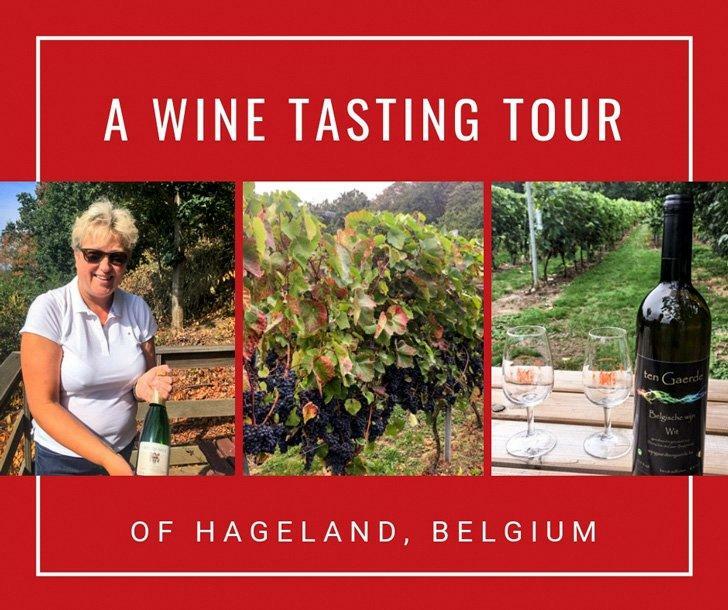 A wine tour of Belgium in Hageland should be on your Bucket List! A 45-minute drive from Brussels and you will be delighted with the spectacular views and hills of the Hageland in Flanders. Situated in the eastern part of the Flemish-Brabant region, between Leuven and Sint-Truiden, you’ll find a hilly agricultural landscape dotted with small towns. The area is most known for its spring fruit tree blossoms, but it is also home to some of the best wine in Belgium. 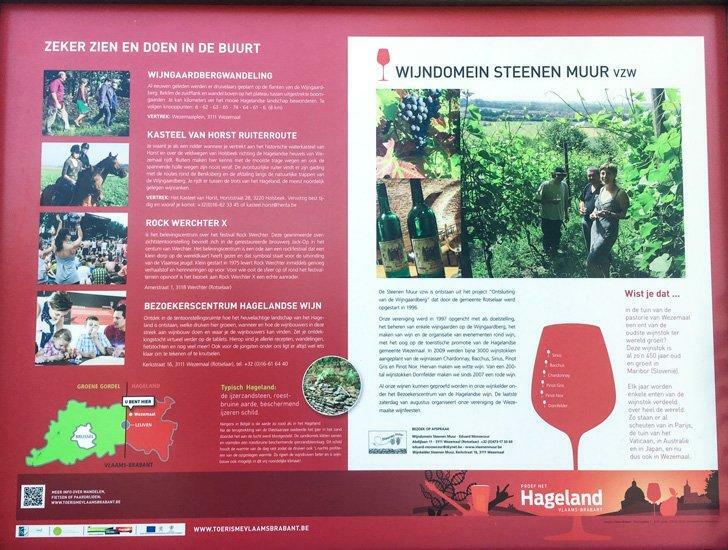 Learn more about the Hageland wine region in Belgium. We began our wine tour at the Hageland Wine Visitors Centre in Wezemaal, Rotselaar. The wine visitor centre is located in a neo-Gothic building, where we met Els, who was our guide for the morning tour. Els told us about the hilly Hageland landscape, the kind of grapes that grow here, and the history of winemaking in the region. The wine visitor centre also has interactive displays to teach you even more about this Belgian wine region. The wine visitor centre in Wezemaal, plenty to do and learn about Belgian wine. The walking tour included some scenic climbs with views of the surrounding countryside. Els then took us to the wine wall which is roughly 2 metres high and made of sandstone and protects the delicate vines from the north wind. Walking up to the wine wall in Wijngaardberg region of Hageland, Belgium. Els offered us a wine tasting of one of my favourite Belgian sparkling wines, Joseph Brut. It was utterly refreshing given the warm weather that day. The Wijngaardberg region is perfect for growing vines because of its microclimate, providing the correct temperature for chardonnays, pinot-noir, and more. Enjoying one of the best Belgian wines with Els and a beautiful view of Hageland, Belgium. If you want to know more about the Wijngaardberg region, you can always book a tour or a walk with Els. 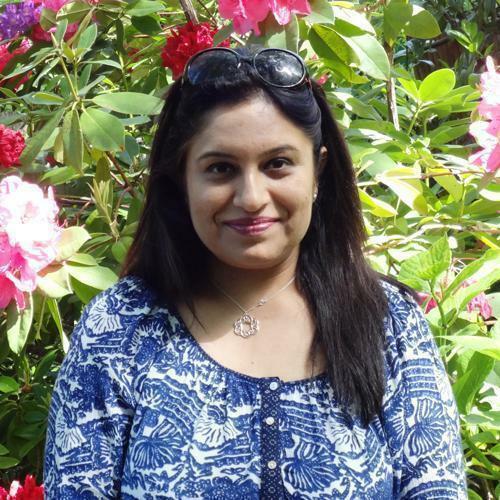 She is passionate about her work and always makes sure each tour is well prepared and researched. Els then left us at the local restaurant Bij Boeres to enjoy an authentic Flemish lunch. We were hungry from the walk and enjoyed a wonderful meal of meatballs with a cherry sauce cooked with beer. The cherry sauce was excellent and provided just the right sweetness to the meatballs. My other half asked for chicken breasts, served with salad and fries. The chicken breasts probably needed more brining, as they were really chewy. Do try the local Belgian lemonade, which was available at the restaurant. It was refreshing and something which I have never seen before in Belgium. 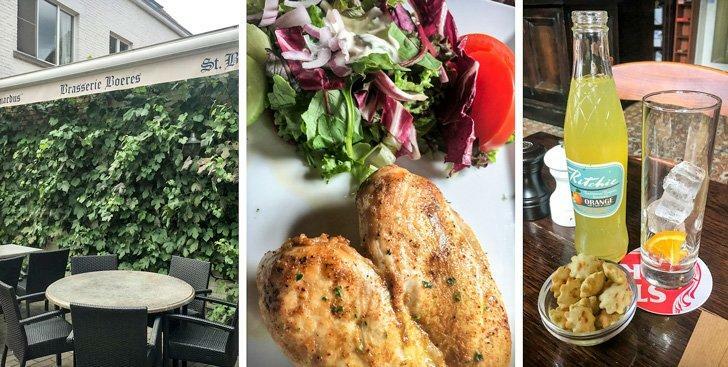 Wondering where to eat in Hageland? Try Boeres Brasserie Restaurant. 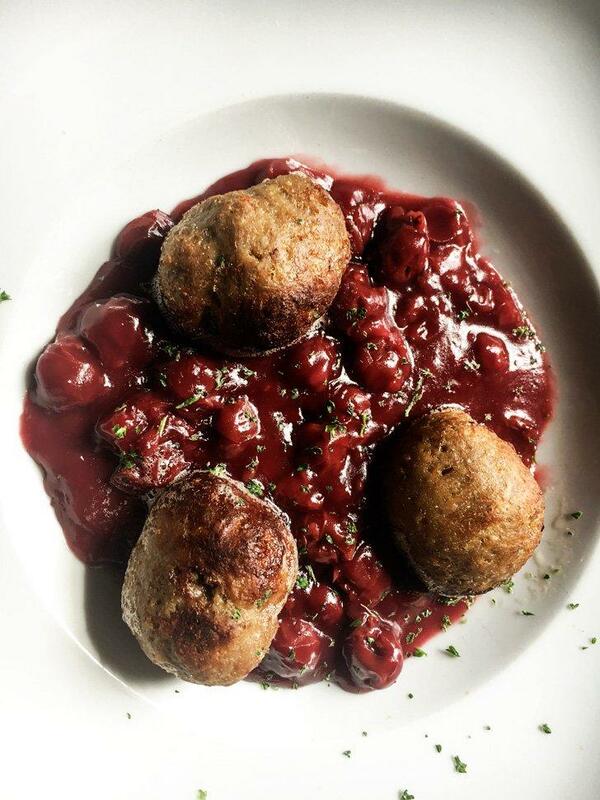 Meatballs with cherry sauce, a traditional Flemish dish. After lunch, we had bicycles awaiting our arrival. Luckily they were not the sporty kind. I was dreading this bit, but to my relief, the cycles were electric bikes and riding on them was a breeze. 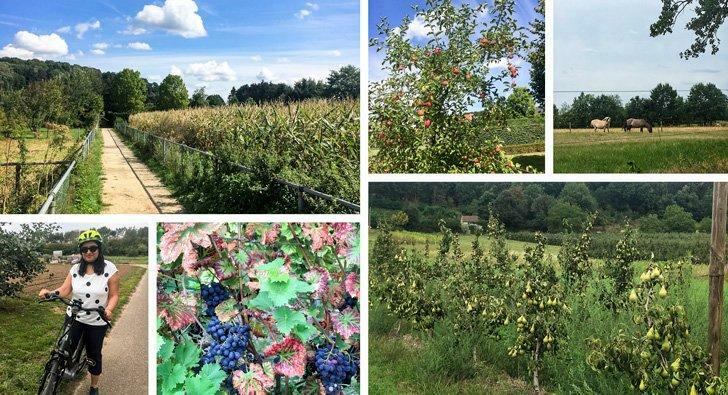 We cycled at our own pace, and it was wonderful to be amidst nature, cycling along village lanes and fruit orchards, with animals cooing in farmhouses. 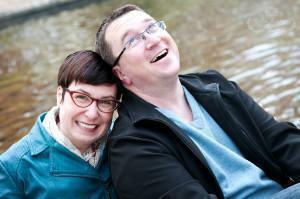 We thoroughly enjoyed the beauty of our surroundings. Cycling along the vineyards and the orchards of Hageland, Belgium. We stopped at Horst Castle for a little while and enjoyed its magnificent surroundings. Horst Castle lies in the Wingebeek Valley, among the Hageland hills and is surrounded by a beautiful pond. Though the castle is presently closed for renovations, we enjoyed its magnificent surroundings and had a bite at the Wagenhuis Restaurant. The restaurant has a lovely atmosphere with candelabras at some tables. If you are looking for a beautiful venue in Belgium outside the big cities for a function or wedding, Horst Castle makes a perfect setting. One of the countless beautiful castles in Belgium, Chateau de Horst. After enjoying a waffle and coffee at Horst Castle, we continued on the final leg of our journey. 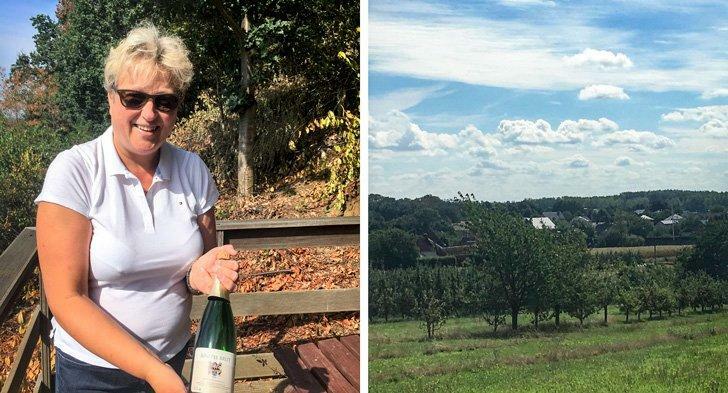 We cycled to Ten Gaerde Belgian Winery where Danny, the winery’s owner welcomed us. 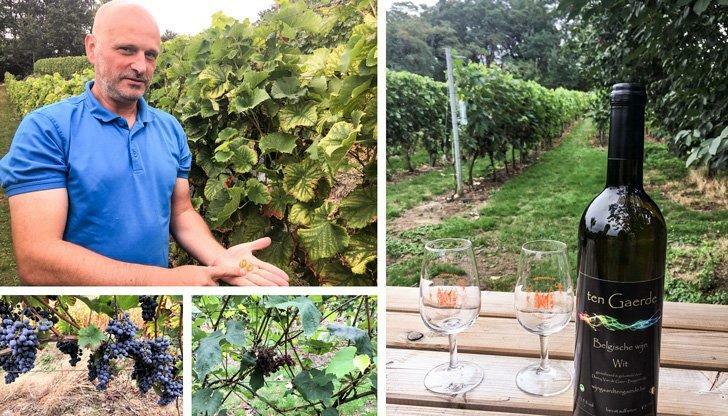 Danny gave us a tour of his winery and explained to how his passion for grapes and his love to work with his hands have translated the winery into a reality by producing Belgian wines. Danny and his family handpick the grapes, so only the very best ones go into the wines. We enjoyed a lovely bottle of Belgian white wine from Ten Gaerde while we continued our conversation with Danny. He told us more about the hills of Hageland, and the type and quality of grapes usually found here. We were supposed to cycle back to the visitor centre in Wezemaal but in Belgium, it can rain when it wants, so Danny was kind enough to drop us back to the wine visitor centre. Danny explaining about the grapes in his Belgian winery, Ten Gaerde, in Hageland. You can book your own vineyard tour with Danny, through Brabant Tourism’s website. 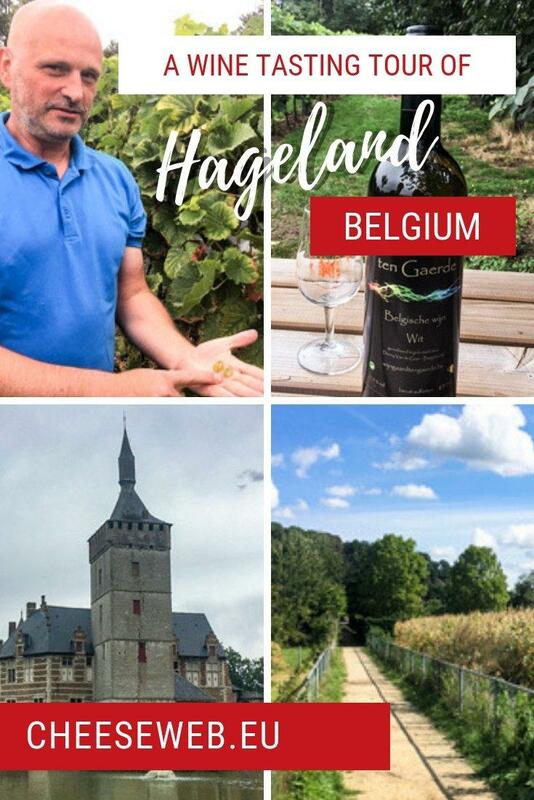 I would like to thank the Flemish Brabant tourism for the invitation and the wonderful experience of touring the Belgian wine region in Hageland, Belgium. You can book a tour for yourself or gift one to a friend. It is an experience like no other!